Like you, dogs are omnivores and are able to thrive on a wide variety of foods, both animal and vegetable. Regrettably most dogs are now fed on commercially produced foods, which are supposed to be designed to give them the nutrients they need but often fall short. A balanced diet for dogs should include water, protein and fat. 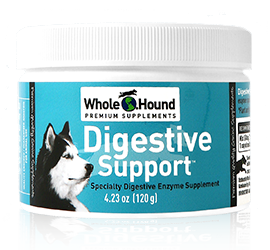 Dogs do not have a specific need for carbohydrates as they can convert protein into the glucose required for energy. Natural sources of digestible fibre are very important. However beet pulp, is sometimes included in commercially prepared diets with the false promise of preventing bowel disease. Dogs also require trace minerals such as calcium, phosphorus, potassium and iron and vitamins A and D are also needed for a long and healthy life. 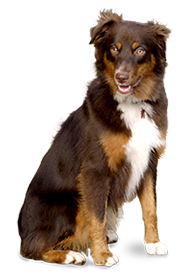 Your dog’s nutritional requirements will change with age. As a growing puppy, his caloric requirements will be higher than as an adult dog. 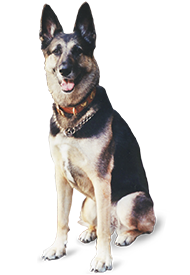 Working dogs also need higher amounts of energy. Older dogs will need to consume fewer calories as they become less active and changing to a specialised senior diet is often recommended by vets. While it can be difficult to resist those pleading doggy eyes, you should avoid giving your pet too many treats and tasty titbits. It is important to feed your dog in moderation. Allowing your dog to overeat will lead to obesity and associated health problems such as diabetes, heart disease and arthritis. Dogs will sometimes overeat through stress or boredom, so owners should measure portion sizes carefully. Under eating and loss of appetite can also become a problem: eating disorders are often caused by separation anxiety. Under eating can also be a symptom of illness. Whatever the reason for your dogs eating issues, you can ensure your pet’s health and fitness by supplementing your furry friend’s diet with quality dog vitamins.